After a round in which Melbourne Victory stamped their class on the competition, the Wellington Phoenix denied the Glory with ten men, and Brisbane and Adelaide fought out a classic encounter at Coopers Stadium, Monday necessitated a good lie down. It was a cracking weekend of A-League football, and Round 7 offers up some more intriguing clashes. It’s all on the line for the Wanderers when they face bottom-of-the-table Mariners, with a win for both teams a must. Perth will look to get back on track after their draw across the ditch when they take on Melbourne City, and Newcastle and Brisbane meet in the final match of the round, both knowing that a loss will set tongues wagging. Mike Tuckerman and Paul Nicholls shared the tipping honours last week with three correct selections and Evan Morgan Grahame held onto his narrowing lead. Good luck with your selections this week, and be sure to enter them into the sheet below to have your say as the roar of the crowd. Here is how the panel sees things playing out in Round 7. Is it just me or is Western Sydney’s clash with the Mariners one of the most fascinating of the round? Markus Babbel is a decent coach, but the Wanderers were truly awful last weekend. Expect the Mariners to ambush them on the dustbowl that is Spotless Stadium. Mark Rudan remains a popular figure among Sydney FC fans, but that probably won’t be the case if the Phoenix nick the points from Steve Corica’s team. The Sky Blues have flattered to deceive so far this season, but they should have just enough quality to see off a Wellington side that rarely travels well. 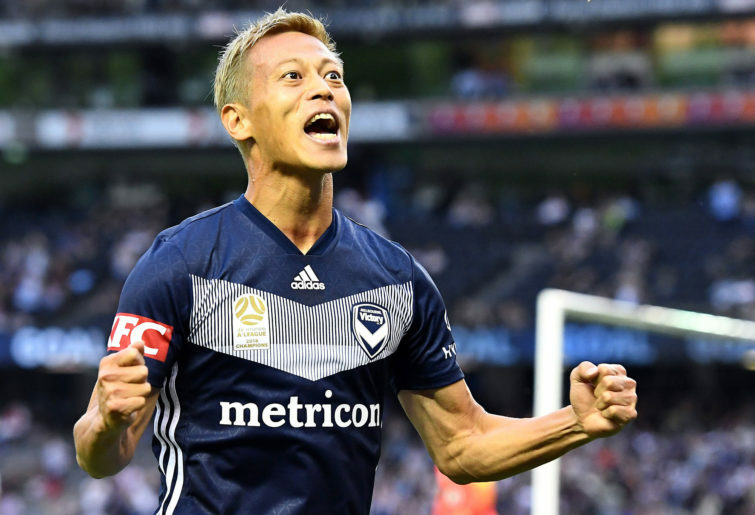 Keisuke Honda is king, Melbourne Victory look imperious and they love the big matches at Marvel Stadium. Adelaide United continue to huff and puff under Marco Kurz without really making an impression, and the high-flying hosts will swiftly dispatch the Reds from whence they came and collect another three points in the process. Perth Glory and Melbourne City remain two of the most unpredictable teams in the league. The wheels could well fall off the Glory bandwagon at some point, while City have got the quality to trouble any opponent. This one may just finish all square over in the west on Saturday night. The Newcastle Jets are the eternal scrappers of the A-League and they’ll have little to fear from the visit of Brisbane Roar – particularly if Roar striker Adam Taggart is missing through injury. There hasn’t been a whole lot of quality on show from either side so far this season, and they could cancel each other out in the Hunter on Sunday afternoon. Let’s hope somebody has hoovered the surface at Spotless after the recent fiasco; as if the Wanderers needed another reason to dislike their temporary home. I’m going with a Mariners win here after something of an unlucky loss to the Sky Blues last week. It is tough to tip Western Sydney after their awful display against Victory. Sydney should beat Wellington in front of a packed house at their new home, although the Phoenix will hope to nick a point after an improved performance last week. The always fiery Melbourne Victory vs Adelaide United clash will give the Reds a rude awakening after their comfortable win against Brisbane last week. This Victory side is looking ominous. If the Roar manage a win, I will be truly shocked. Perth and Melbourne City clash in the west in what should be a belter, with City on the back of a win and the home side upset about letting points slip against the Phoenix. A draw seems likely. Late Sunday, Newcastle and Brisbane will be competing in the desperate derby. The loser of this match will face a grumpy face in the mirror come Monday morning. Bluntly, they both have to win, hence a tense draw looks a distinct possibility. The Western Sydney Wanderers and Central Coast Mariners are almost in a race to the bottom. The Mariners showed plenty of heart against Sydney FC last week whereas the Wanderers barely showed up against the impressive Victory. I can’t see there being much in this game, and hopefully the plastic cup graveyard surface has improved. Draw. Mark Rudan, one of Sydney FC’s greats, will be plotting to get one up on his former club. The Wellington Phoenix coach would have been happy with last week’s first-half performance and the good form of Roy Krishna. 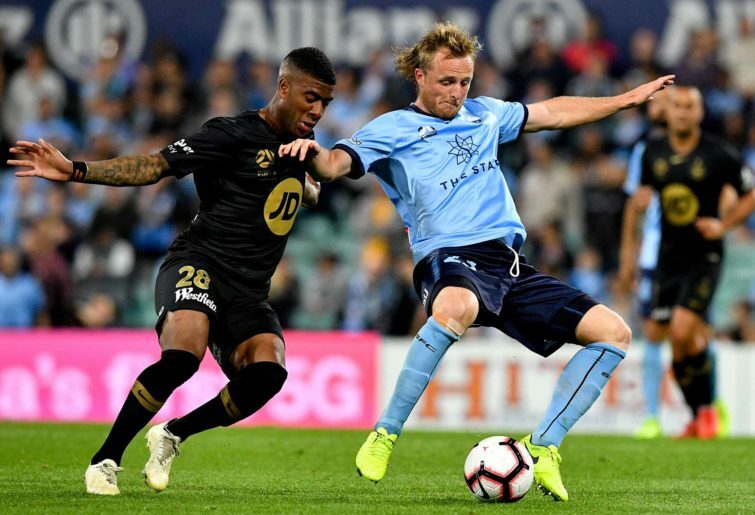 Steve Corica’s Sydney FC rallied well after going behind against the Mariners, and the contributions of midfielder Brandon O’Neil to the Sky Blues cause this year has attracted overseas interest. Sydney FC to win. If there are any two teams that bring the best out of each other, it is Melbourne Victory and Adelaide. These matches never fail to deliver. Can Craig Goodwin and Isaias of Adelaide match the flair of the Victory side who were in thrilling form last week? I doubt it. I expect more of the same, with Keisuke Honda pulling the strings and Terry Antonis showing sparkling form. There were some deft touches from Ola Toivonen as well, whose value to the Victory is increasing every week. Victory to win 3-1. No doubt Warren Joyce will be eagerly awaiting news from the treadmill, where enigmatic striker Bruno Fornaroli is burning the calories. Not to matter, because Melbourne City were good last week without him. Tony Popovic’s Perth were caught napping in Wellington but clawed it back well in the second half. In the end Popa would have been reasonably satisfied with the point. Two tips for this one: Glory to win and City fans to boycott the game. 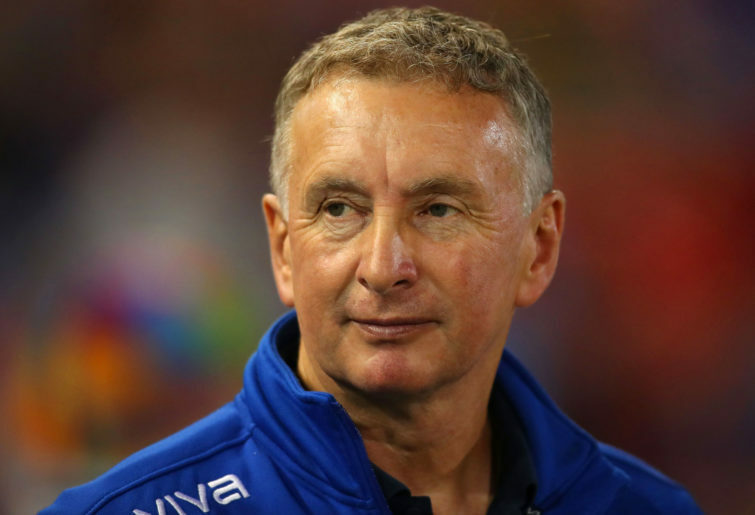 Newcastle coach Ernie Merrick’s lament: a striker, a striker, my kingdom for a striker. John Aloisi’s lament: give me passion for the full 90, not just the last five. Words are wind. Newcastle to win the lacklustre derby. The Mariners watched on as Brandon O’Neill’s howitzer of a shot obliterated their hopes of a point last weekend, but the performance that forced that stunning winner was a lively, encouraging sign. Western Sydney were absolutely styled on by a full-strength Victory; they, on the other hand, have very little positivity to draw from that shellacking. There aren’t many teams as offensively intimidating as the Victory, and yet the ease with which they sheared through the Wanderers defence was still alarming. I sense another fearful Wanderers defeat to a Mariners side out to make good on the hints they offered a week ago. Wellington were robbed of a win last weekend, and Mark Rudan smouldered in the post-match press conference. A few drops of lemon juice were squeezed into the open wound that injustice left when it was confirmed the decision to send off Ryan Lowry was wrong. Super. Still, as much as their seething might indicate that another good Phoenix performance, out of pure spite alone, is on the way, the Nix perform markedly better at home than they do on the road. Sydney were not at their best last weekend but got away with it, winning almost out of muscle memory. They will rouse themselves for a fine win this week. Melbourne were sneeringly good last weekend, a panther toying with its prey. The final goal, when Ola Toivonen coolly laid off for Terry Antonis to ram the ball home, one last haymaker just for good measure, provided a merciless thud to end things. That Keisuke Honda was seen remonstrating with his teammates, urging for more, ever more – a stance he reiterated in that compelling post-match interview – makes one suspect an equally good performance will come this week. Adelaide walked out of their win a little like a man emerging from a bar fight – victorious, sure, but a little dazed and confused, and a little sheepish about the carnage in which he took part. Victory are simply too talented, and if they maintain the intensity their Japanese talisman insists on, they will win. Well, Perth kept their unbeaten record intact, just, having traipsed over to Wellington last week, and so will welcome a home game this Saturday. Melbourne City made mugs of all of us, waving away that gloom overhead and trouncing the Jets 3-0. Consistently inconsistent, will this City uptick last longer than a game or two? Will Warren Joyce? Perth looked a little impotent but will be better at home; they are top for a reason. A tight Perth win. Brisbane and Newcastle, through the fog of the early season, are assuming similar silhouettes of the slightly frumpy shape of this season’s also-rans. Not quite bad enough to warrant concerned inspection, not quite good enough to warrant jubilant praise, they are placed sixth and seventh respectively and are now more than three points adrift of the pack ahead of them. Indeed Brisbane is as close – keeping in mind the season’s infancy – to bottom-placed Central Coast as they are to Melbourne City, the team directly above them. Again a slow start hampered Brisbane last week, and their comeback was immolated when the match combusted suddenly into violence. Newcastle were forced to watch their old pal Riley McGree doing his particular, energetic, occasionally mesmeric thing in the City midfield; the Jets are not coping without Roy O’Donovan, and have not adequately replaced McGree or Andrew Nabbout, a disappointing state of affairs. A draw.